↑ Purves, Dale (2011). Neuroscience (5. ed.). Sunderland, Mass. : Sinauer. p. 341. ISBN 978-0-87893-695-3. ↑ Drake, Richard L.; Vogl, Wayne; Tibbitts, Adam W.M. Mitchell (2005). Gray's anatomy for students. illustrations by Richard M. Tibbitts and Paul Richardson. Philadelphia: Elsevier/Churchill Livingstone. pp. 192–194. ISBN 978-0-8089-2306-0. ↑ Colledge, Nicki R.; Walker, Brian R.; Ralston, Stuart H., eds. (2010). Davidson's Principles and Practice of Medicine. illust. Robert Britton (21st ed.). Edinburgh: Churchill Livingstone/Elsevier. pp. 838–870. ISBN 978-0-7020-3084-0. ↑ Patti, MG; Gantert, W; Way, LW (Oct 1997). 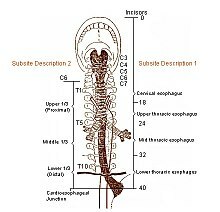 "Surgery of the esophagus. Anatomy and physiology.". The Surgical clinics of North America. 77 (5): 959–70. PMID 9347826. doi:10.1016/s0039-6109(05)70600-9.